Washington, DC—Most Americans surrender, line up like sheep and allow the despicable practice of the TSA's amateur security workers as they have their way with our personal property, bodies and even our children. They abuse us tolerated simply because Americans are to intimidated to defend themselves. Despite hundred of billions of dollars and this illusion of security the TSA has not stopped a single terrorist event. The known post 9/11 efforts to disrupt air travel have been stopped by alert passengers that understand their duty to protect each other. The TSA is in itself a meaningless exercise of the absurd. Our government puts these poorly vetted, trained or educated unemployable losers in police style costumes with gold badges. The reality is they should have put them into red jumpsuits and saved taxpayers a bundle rather than allow this officious masquerade. Here are three videos. One is a musical satire hit piece from, Without a Face, Twisted Sexual Assault. The second is from a political opponent of former House Speaker, Nancy Pelosi named John Dennis. 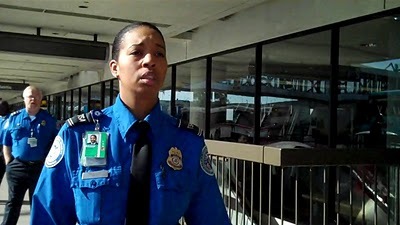 The third video is that of a shocking encounter I had with an African-American TSA bimbo named Butler, trying to seize my camera and prevent me from shooting video outside of Terminal 2 at LAX. Put hand over eyes while walking into battle?